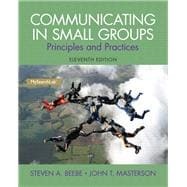 by Beebe, Steven A.; Masterson, John T.
With an emphasis on real world examples, technology, and ethical collaboration, Communicating in Small Groups: Principles and Practices helps readers enhance their performance in groups and teams, while giving them insight into why group and team members communicate as they do. MySearchLab is a part of the Beebe/Masterson program. Research and writing tools, including access to academic journals, help students understand critical thinking in even greater depth. To provide students with flexibility, students can download the eText to a tablet using the free Pearson eText app. Dr. Steven Beebe is Regents’ and University Distinguished Professor of Communication Studies at Texas State University. Dr. Beebe is serving in his 28th year as Chair of the Department of Communication Studies. He has served as Associate Dean of the College of Fine Arts and Communication for 25 years. He is the author and co-author of twelve books, with most books in multiple editions. He has authored or co-authored more than 60 articles and book chapters and made more than 150 presentations at regional, national, and international conferences. Steve has been a visiting scholar at both Oxford University and Cambridge University and is a member of the Common Room of Wolfson College, Oxford University. He has given lectures and presentations in Europe, Australia, Asia, South America and has made 14 trips to Russia where he has been instrumental in establishing the first communication courses there. Dr. Beebe teaches courses in small group communication, communication training and development, pubic speaking, interpersonal communication and C. S. Lewis. He made international headlines in 2009 when he discovered a manuscript in the Oxford University library that was the opening chapter of a book that was to be co-authored by C. S. Lewis and J. R. R. Tolkien. He teaches a course about C. S. Lewis and Communication at Oxford University. He was named Outstanding Communication Professor in America by the National Speaker’s Association, and has received the President’s Award for Excellence in Research, and the President’s Award for Excellence in Service—the highest research and service awards at Texas Stat. Steve was also named Honors Professor of the Year at Texas State. Steve and his wife Sue were named Outstanding Alumni by their Alma Mater, the University of Central Missouri. He is currently President of the National Communication Association, the largest professional communication association in the world. Dr. John Masterson is Executive Vice President and Provost emeritus of Texas Lutheran University. He has taught Communication courses for over 30 years and has presented or published dozens of papers and articles as well as four books co-authored with Steven Beebe. He has been the recipient of numerous awards and honors for his teaching, his scholarship, and his service. Prior to his move to Texas, Dr. Masterson served the University of Miami (FL) for 22 years as professor of communication, associate dean of the School of Communication, dean of the Graduate School of International Studies, and vice provost for Undergraduate Affairs.